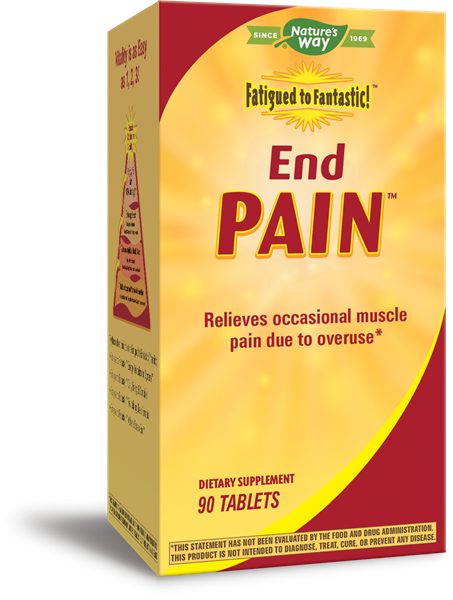 Fatigued to Fantastic!™ End Pain™ / 90 tabs - Nature's Way®. Fatigued to Fantastic! End Pain belongs to the family of products developed by Jacob Teitelbaum, M.D., a board-certified internist and recognized expert on pain. Dr. Teitelbaum developed the Fatigued to Fantastic! products based on his extensive research and clinical experience. He is the author of the best-selling book From Fatigued to Fantastic!™ and Pain Free 1-2-3! Take 1 tablet three times daily. May increase to 2 tablets three times daily, if needed for additional support. Though relief will be noted immediately, continued use may be needed to achieve maximum effects. Can I take Fatigued to Fantastic! End Pain every day? How quickly will I feel the effects of Fatigued to Fantastic! End Pain? I am sensitive to aspirin. Can I take Fatigued to Fantastic! End Pain? You should not use Fatigued to Fantastic! End Pain if you are allergic aspirin, or have been advised by your healthcare practitioner to avoid products containing aspirin or salicylates. Do not use this product if pregnant or nursing. Do not use this product for children with a fever. Do not use if you have an ulcer or are allergic to, or have contraindications to aspirin or other salicylates. If taking blood-thinning or any other medications, consult a healthcare professional before use. Discontinue use two weeks prior to surgery or if stomach upset occurs.